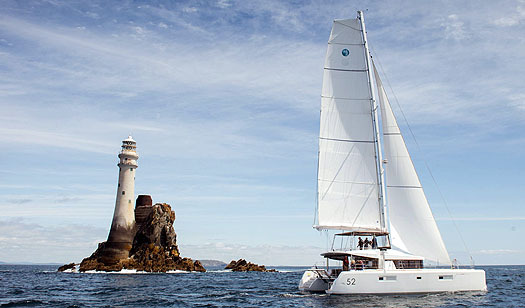 The new Lagoon 52 "Is Feider Linn" takes in a circuit or two at the Fastnet Rock on the way to make her debut in Dublin Bay. #lagoon52 – We've had enough of recession with its blighting effect on Ireland's marine industry. W M Nixon assembled a team who've kept going through thick and thin, and went sailing with them this week on a new vessel which challenges most perceptions of what a boat should be like. It's time to wake up and smell the coffee. Time to shake off the torpor of economic recession and savour the aroma of new boats after six years of making do with the old. Time and more to go out and try something new, something different - something very different. So let's see if we can go out sailing on a new Lagoon 52, getting a team of all the talents and experience together to do the assessment. The Lagoon range of cruising catamarans isn't utterly new. Though the Lagoon 52 is one of their most recent models, they've been in the multihull business in southwest France since 1984. But while their boats may leave two wakes astern, as a design development and production organisation they've been ploughing an increasingly individualistic single furrow for some time now, so much so that the simple word "boat" doesn't quite seem to fill the bill any more. Yet for some people, a Lagoon is the only boat. The company's production facility is an autonomous unit within the enormous Beneteau umbrella by way of their link with Jeanneau. And as their speciality is big ticket catamarans with more than a certain je ne sais quoi, the firm turns over more euros than any other single part of the Beneteau galaxy. But the company's growth was at a particular stage a dozen years which meant that it didn't try trading on the crazy boom years in Ireland. Maybe it's just as well. For now, with the faintest glimmerings of recovery in our marine industry, Lagoon – through their Irish agents MGM Boats - are putting a serious toe in the Irish water, even if the Lagoon 52 in particular has been developed with warm blue water cruising in mind. As it's often the unorthodox operators who are emerging from the recession with something in the way of resources, so it's the unorthodox style of the Lagoons which appeals to a certain but real sector of the market. They'll be people who have shown themselves ready to seek out business in every last corner of the world where business might just have been done when everything was asleep at home in Ireland. People who don't have the old-fashioned notion of boat-owning as having your pride-and-joy based in the harbour nearest to home. On the contrary, they'll be people who think it's only sensible to have your boat based where the sun shines and the sea is warm and the balmy breezes blow. People who reckon that when they're not using the boat themselves, then the boat should be able to do a bit of work for its own living. People, in short, who are certain that a boat like a Lagoon, which can be successful in a holiday area as both a charter operation and a private sailing project, is the only way to go. Yet no sooner do you think you have these Lagoon owners neatly pigeon-holed, than one of them turns out to have bought one recently to base it at a marina near you in Ireland, just like anybody with an old-fashioned boat. But more of that anon. Meanwhile, what's with the Lagoon 52? The main design and concept developers to Lagoon (who have their own in-house design department) is VPLP, the Marc Van-Peteghem/Lauriot Prevost consultancy and project management group, who cut their teeth with some formidable big total racing multihulls. It's still a significant area of their work, and that in turn gave them the expertise to create the huge multi-hulls used in the flawed cinematic masterpiece Waterworld starring Kevin Costner. As for the Lagoon's accommodation layout and styling, they were master-minded by Masimo Gino of Nauta Design in Italy. Unless you've seen other earlier Lagoons, nothing quite prepares you for the appearance of the Lagoon 52. She seems much bigger than her overall length of 52ft (15.84m), but then she's bulked out with a beam of 28ft 3" (8.6m), although it's all on a manageable draft of 4ft 11 ins (1.5m). However, even a 52 foot catamaran will still have much of her accommodation dictated by the relative slimness of the hulls which are the only units that provide what we might call inbuilt headroom. So the need for height has been met by building ever upwards. Essentially, the concept is of a sailing platform in which most of the full headroom is provided in the large deck saloon/galley area by adding elevation. And as this spacious setup is integrated with an extensive "patio" area aft by means of wide sliding doors, in order to provide a clearly delineated helming and control area the designers have simply continued on upwards with the cockpit – more accurately a fly bridge – on top of the deck saloon in a shallow well. The hull profile shows that the fin keel is only vestigial in order to keep draft down below 5ft, yet the boat tacked with certainty every time. Is this a one-masted schooner? The amidships location of the mast reflects experience gained in big racing multihulls. Thus we've a three storey boat. And the effect of height is accentuated by a substantial fractional sloop rig which tops out at 89ft 4ins (27.22m) above the waterline. As for the location of the mast, it comes down in the middle of the deck saloon (supported by a robust strut through the saloon itself), and thus is located almost amidships. This mast location is now almost a trademark of the VPLP racing multihulls, but in a boat of clearly cruising emphasis, you can't escape the feeling that this is really a one-masted schooner. Whatever, it works and it works very well. But as I hadn't done any serious multi-hull offshore sailing since the briefly-held 1986 Round Ireland Record with Robin Knox-Johnston on the 60ft cat British Airways, everything pointed to an assembly of specialists to give the Lagoon 52 a going over, and first choice was Con Murphy and Cathy MacAleavey. These days they may be best known as parents of Olympic sailor Annalise Murphy and her remarkable siblings, but 21 years ago with Steve Fossett on the 60ft trimaran Lakota, they set a 44-hour Round Ireland Record so perfect that it still stands today despite several high powered challenges down the years. We also had Rod Martin who may be best known sailing a First 44.7 on Dublin Bay, but out west in the family place in Connemara they've a handy Dart 18 catamaran, thus Rod has sailed fast in a cat along the kind of challenging coastlines most of us only dream of or glimpse briefly. His wife Sally came too, and so did his shipmate Eddie Burkart, one of those practical guys you'll find delving energetically into the depths of the engine room when all about are gazing at the beauty of the sky. For a sensible practical input, we'd sailing couple Ian and Judith Malcolm who brought a wealth of experience, as Judith's family have owned a range of performance cruisers both power and sail, while Ian manages to be a stalwart of both the Water Wags and the Howth 17s. As for the realities of assessing longterm liveaboard viability, plus the practicalities of stowage for cruises of varied length together with the utility of the galley and the workability of the deck for those handling warps and so forth, my daughter Patricia came along as she and her husband Davy cruise their Oceanis 43 for four months every year in an extended voyage through the Med. But as they're home during late July and August to avoid the worst of the Med's heat and high summer crowds, she was keen to sail on a Lagoon 52 in Dublin Bay. Out on the bay, there was no way she could complain that it was too hot or too crowded on Tuesday August 19th. We'd had a warm and lively lunch beforehand with everyone engrossed by Con and Cathy's tales of setting the record back in September 1993, and we'll have a blog about it here during the winter. But getting aboard in Dun Laoghaire Marina saw yet another of a series of downpours, and though it warmed up in bursts of sunshine which came hyper-bright in the radiant air, between times in rain and wind there is no doubting that the dogged remnants of Hurricane Bertha were still squatting over southern Norway and hauling Arctic air southward to mess up an entire month of the Irish Summer. Far from ideal conditions for a boat report, you might well think. But thanks to Ross O'Leary and his colleague Gerd from MGM Boats, we turned an unpromising afternoon to advantage, chasing wind where it might be found even if it was in the midst of rain, and gradually getting to know a boat which is just so different that you have to chuck all pre-conceived notions of "boatiness" out the window. Ross was more than comfortable with the Lagoon 52 thanks to extensive experience with her, as she'd been brought up from Les Sables d'Olonne deep in Biscay on a circular delivery towards next month's Southampton Boat Show, taking in the Fastnet Rock and a spot of cruising in West Cork before shaping into Cork Harbour, then on past the Tuskar and into Dublin Bay. In honour of this pioneering visit to Ireland, the boat had been named Is Feidir Linn. The port of registry may be Les Sables, but "Yes We Can" seems the perfect name for a boat trying new markets in a recovering economy. And it was also an apt answer for anyone who wondered that such a sailing sky-scraper could go to sea at all, for not only had this boat made her voyage along Europe's Atlantic seaboard in a very unsettled summer, but sister-ships have crossed the Atlantic in increasing numbers to serve the Caribbean charter trade, matching the sailing experience of the first one to go across, which was regularly posting 200 day runs and had a best 24 hour sail of 220. These are good figures, though by no means fantastic, but they reflect the reality that this is a blue water party platform for fun holidays - the fact that she can sail is almost a bonus. Even with our difficult weather conditions when we had to go chasing breeze where it might be found under lurid-looking clouds, we found she was soon sitting happily enough on a close reach at 7 knots in a moderate air, and when in one downpour we found a little bullet of 24 knots of wind, she was soon merrily ploughing her twin plumes at 9.8 knots with apparent wind at 70-80 degrees. In between the rain when the sun came out in hyper-bright bursts, a different boat emerged. It was as though we were on a photo set for an avant garde architectural journal. And the crew could enjoy the boat's many options. Les Girls thought the forward cockpit was the best place of all, well away from the nitty gritty of sailing, and free as a bird to enjoy the sense of flight above the water which was at its best when reclining in the netted trampoline decks forward, watching the ever-changing and soothing bow-wave. Up top on the fly bridge, you're much more remote from the water, and the steering is equally remote – it helps that one of the panels on the dashboard tells you the rudder angle. However, once into the groove, she was fun to sail, and everyone was impressed by how positively she tacked. She never faltered once in dozens of tacks, which had not been our experience in some other catamarans. As for sail handling, the rig may seem remote in it towering heights, but there's no doubting its power. An orthodox sailor might be concerned that, for the final stow of the main in its stackpack, you've to climb a vertical ladder to the uppermost deck over the steering position. But when it came to do the job Gerd managed it with no bother whatever, and as for the ordinary sail handling during the course of the sail, a battery of electric winches does all the hard grind, while a neatly fitted self-tacking jib works a treat. In all, it's a potent looking rig developed from racing multi-hull experience, and as all the trimming equipment verges on the generous side, you can throw gybes and tacks without making a bother for anyone else on board, unless your new configuration of the sails blocks off the sun from their favourite sun-bathing position, which was mostly something we could only imagine on our showery day afloat. It took as long to get a sense of the accommodation as it did to appraise the big boat's outer appearance. Once again you have to chuck out most of your old notions, as she only heels very little, and motion is mostly slight, albeit with sudden little jerks such as you experience on the cross channel fast catamaran ferry Jonathan Swift. As to ultimate stability, despite her towering appearance she feels ever more solid under foot with every mile sailed, for she chimes in at about 30 tons all up, and most of the weight is well down in the hulls. The cool style of the décor as seen in the main saloon is not necessarily to everyone's taste, but if you like it, you like it a lot. Thanks to being 52ft long, the hulls - while slim in multihull style - are still wide enough and deep enough to make a worthwhile contribution to comfortable cabins. In smaller cats, the double berths tend to be intimate tunnels running fore and aft, filling every available inch of the hull. But with the Lagoon 52 they've the space to install the double berths athwartships in three of the ensuite cabins, and the "master stateroom" on the starboard side aft is positively luxurious in its availability of space and style. As to that ultra-wide multi-purpose saloon/control desk/galley and dining area, I first got a true impression if its enormous space when emerging from the forward cabin on the port side, looking up the steps and across the saloon to realize that the crewman sitting opposite was very far away indeed. 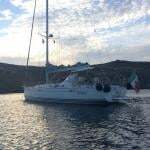 The boat we sailed was very comprehensively equipped, and you could see where the priorities lay – the fridge for the wine is handily in the galley, while the main working fridge is located at the foot of the stairway leading to the two starboard cabins. They're a nice touch, those stairs. For if those living aboard who find the inevitable partying is going on for too long, they can quietly slip away down these almost invisible exits and find their bunks in peace, leaving whoever is accommodated in the aft port stateroom to see the guests off the ship, as they can only get to their bunk via a very visible entrance off the cockpit area. "Cockpit area" is just about the only way to describe the aft "veranda" in any nautical style. It's a wonderful space, and being comfortably ensconced within it gives you a much better impression of how the boat is trundling along in her merry way than if you're up in the fly bridge, which has a certain sense of remoteness no matter how long you are up there, even if you're using the special feature of the steering wheel which allows it to cant left or right to find your most comfortable steering position. Not that you'll be using it for long, for with her efficient systems, this is a boat which will be largely steered by the auto-helm. 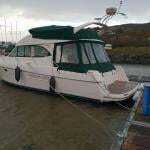 And should they be needed, the 56hp engines with saildrives, neatly located in each hull down aft, move the Lagoon 52 very sweetly indeed with little fuss and less noise. In fact, with her ultra-modern architecturally-inspired appearance and ease of movement under quite small power packs, I suggested to Ross that she surely would make a very handy if unusual motor-cruiser. Not surprisingly, he said that there is already a handsome power version of the Lagoon 63 available which cruises at 12 knots and can reach 16 with very little bother, and in a very few weeks time there'll be a similar variant on the Lagoon 52. But meanwhile, having squeezed every ounce of potential out of every last puff of wind available on Dublin Bay, we'd the chance to see how this bulky vessel could be fitted into her marina berth. By this time it was calm again and the sun had returned, gentle berthing conditions, but even so Ross gave a very smooth performance. Those of us new to the boat and watching from the height of the fly bridge got yet another perspective on her width and height by realising that the handy little blue boat way down to starboard as we reversed in was the Nicholson 58 Rebellion, while the slip of a tiny sloop just across the pontoon was George Sisk's Farr 42 WOW. The abiding memory of the afternoon is of having a good time in congenial company. This tells us much about the spontaneous atmosphere aboard a Lagoon 52, but is scarcely conducive to filtering advice for anyone thinking of buying one of these remarkable boats. Not surprisingly in such a varied team, the views were mixed. All were pleasantly surprised by the boats readiness to tack without a bother, but initially they'd found that the helm at its remote heights seemed at a remove or two from sailing the boat, with a distinct lack of feel. As to the performance, the frank conclusion was that this is really a motor-sailer. Certainly she'll sail along very well indeed when conditions are right, but that will be straight line sailing – for multi-directional sailing and up-close manoeuvring, you'll expect to call on the engine at least occasionally, and she doesn't seem to be a serious sailing proposition at anything higher than 55 degrees to the wind, while 60 to 90 degrees is her happy slot. If you have the chance to unfurl the big Code Zero with the wind freed, you're in business and then some, but it wasn't suitable for a hyper-gusty day on Dublin Bay. However, the sail control systems were so efficient that everyone found they were soon forgetting the sheer area of sailcloth in use, even under simple working rig. There's a lot of power there. The accommodation got wide approval, the excellent provision of stowage both in cabins and the general areas getting an enthusiastic thumbs up. Particular note was taken of the number of handy and capacious drawers – you'd be surprised how few drawers are installed in many modern production boats, leaving under-utilization of roomy stowage space which is otherwise difficult of access. As for the general ambience of the finish and style in all the accommodation, the team thought it distinctly bland. When I pointed out this was probably to allow each owner a chance to make a personal style statement, I was tartly told that at these prices you'd expect the designers and builders to help them further along the way towards that personal touch. However, Patricia recalled meeting a couple who were cruising the bigger sister, the Lagoon 63, and she said that their boat had been so stylishly and effectively personalised to create a superb floating home that it took an effort to realize there was a standard Lagoon underneath it all. So I looked up the information again, and found that in one statement Nauta Design asserted that they sought to provide the "association of geometric forms with "warm" materials, while optimizing the use of space", while in another comment Massimo Gino tells us that: "Our main objective has been to improve the use of space, providing sober, bright and comfortable living spaces, to suggest the "just like home" feeling for the owner and guests on board". What with his ideas first being formulated in Italian and then into French and on into English, something may have been lost in the translation and "sober" is surely not the mot juste. But nevertheless the advanced Italian design style seems almost too cool for Irish tastes, with one of the panel suggesting that having the main part of the accommodation at deck level just didn't feel right, aboard a cruising boat they expected to descend into the warm ambience of a traditional saloon. Maybe so, but our panel has had wide experience of sunshine cruising, and they said for that, particularly the in-port bit, the Lagoon 52 would be ideal, and they could already feel the pleasant breezes wafting through the spacious public areas as the boat lay gently to her mooring. On the layout, there was general approval, but it was felt that though the important areas around the fly bridge were cleverly thought out in terms of space and access up stairways and so forth, there was a serious lack of any useful grabrails when going up or down. In fact, it was felt there was a lack of grabrails generally, but that may be because we were basically a team of mono-hull sailors and hadn't become accustomed to the different motion of a catamaran and it reduced need for handholds. There was a feeling that the clear view forward from the seated steering position would not be unduly hampered by the provision of a pulpit rail at the forward end of the fly bridge for safety. As to the helmsman's seating, it might be much improved by having some sort of back rest. If Ireland's trawler skippers are prepared to spend more on their special chair on the bridge than on almost anything else, then surely a catamaran chiming in at more than €1 million could manage a comfortable seat rather than just a bench settee for the helmsman? On deck, there was concern that although the provision of extra high three-wire guardrails round the side decks was very welcome, at the stern directly above the two transoms the removable gate wires were lower with just two – "It seemed to just ask you to fall overboard" was one comment. While the space and style of the deck impressed everyone, my own feeling was that it would be further improved by having a solid rail along the top of the guard rails. A curve of varnished teak in traditional style wouldn't be at all in keeping with the boat's look, but some sort of elegant plastic extrusion would not only be lower maintenance, but it would make the decks feel much more spacious and welcoming. The boat as we sailed her is priced at €950,617 before VAT. A complex very fully equipped boat like this deserves much more than just one afternoon's sailing appraisal, but we have to deal with life in the real world, and anyone thinking seriously about the big step will put in many days of research. Our test panel have all all reached the stage where they're veering towards classics rather than the latest in design, styling and technology. But when I mentioned that The New York Times insists on any restaurant being visited at least three separate times before they'll publish a review and that therefore we should continue our assessing of the Lagoon 52 in a sunny clime, the answer came in perfect unison: "When can we go?" And as for that Lagoon catamaran being sold to a marina near you in Ireland, next day I popped over to Malahide to look, and there she was indeed, a Lagoon 39, owned by a keen sailor who was once a mono-hull man, but this is his second cruising cat. A Lagoon 39 in her home berth – could it be the Camargue perhaps.....? The first view was through cordylines which looked enough like palm trees to give Malahide some exotic Riviera style, but after savouring that unique and extraordinarily attractive cabin design style again as replicated in the 39, I took another photo from the town waterfront, just as the local lady's skiff rowing crew were heading past, to show it was undoubtedly Malahide. At the Sea Scouts' boathouse, they told me all their crews were in training for the East Coast Skiff Championship at Dun Laoghaire in the last weekend of August, just a week hence. "Who are the top teams? I asked. "Malahide are champions" came the chirpy reply. "That's all you need to know".